I love pumpkin. It’s my favourite vegetable and if I could only take one food to a desert island it’d be pumpkin. So I was super excited to spend a whole night with the seed savers group talking about nothing but pumpkins (and a few other vegetables in the cucurbit family). We covered the while life cycle from seed to stomach and this is the information I took away from the session. 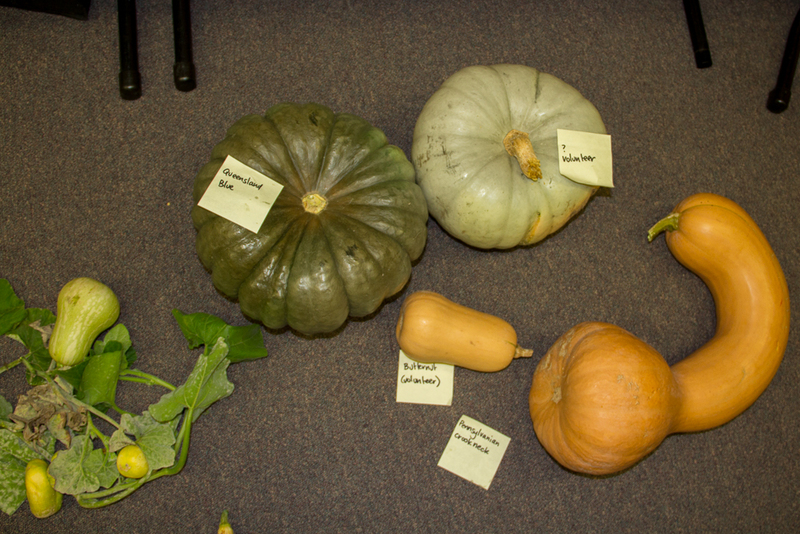 Lou (Seed Savers Albury-Wodonga president) initially noted the three species of pumpkin. Varieties of pumpkin in the same species will cross-pollinate, while those from different species will not. Therefore if you know your pumpkins, you can potentially grow multiple varieties at once without them cross pollinating. She showed us how to identify different pumpkin species by the look of the seed eg: raggy edges, thin seed, definite outline on the edge. Lou mentioned the Seed Savers Handbook has lots of great seed collecting and identification tips in it including a special section on cucurbits. Ideally plant your seeds straight into the ground but don’t be too early and eager. Wait till mid-October to early November when the soil temperature is 20 degrees. Chop off the leaders by a third to get more branching and hence more fruit. Consistent watering or the pumpkins may split. You can pollinate yourself with the male flower stalk or by collecting pollen with a feather. Or my preference of letting the bees do the work! Flowers only last a couple of days. If the vine is growing up a tree consider using stockings as hammocks to support the pumpkins so they don’t fall on your head as one member has experienced! As the fruit is maturing turn it around so all sides see the sun and the skin cures. If you don’t you get pale spots and this is the place the pumpkin will rot first. Wait till the curly tendril nearest the stalk dries off before cutting the fruit from the plant. Leave a long stalk. For fruit at the end of the season, harvest before the first frost and if not yet mature, leave a long length of vine attached to keep it maturing. After growing pumpkins add organic matter to the soil, plant a green manure or grow something that doesn’t need lots of nutrients eg: root crops. Try to rotate the place you grow pumpkins. Pumpkins can be stored for up to a year, dark place, even temperature. Collect seed from mature pumpkins that you like the shape/characteristics. Pumpkin seed can just be washed and dried. Needs to be super dry before storing it. Other cucurbits (cucumber, rockmelon etc) need the same treatment as tomato seed – soak seed in a little water few days until mould appears, rinse, dry and store. If your knife gets stuck in the pumpkin, drop it onto the floor and the pumpkin will split and pop out the knife. Can cook and freeze excess pumpkin. Try freezing it raw too. Make a basic soup and add coconut milk to jazz it up later. Pumpkin goes well with nutmeg, orange and granny smith apples. Try adding these to the soup. It was a great night with many people adding to the discussion and comparing varieties they grow. Then we tasted yummy pumpkin food and chatted about cooking with pumpkins. Surprisingly our president admitted that she doesn’t really like to eat pumpkin, hopefully we have changed her mind! Wait, wait, wait to plant until the temperature’s right. September may still be too early to get your cucurbits in. Soil temperature above 20 degrees is critical. Cut the front runner vine back by as much as 1/3 to promote lateral growth. It’s the laterals that the fruit will develop on. If you have powdery mildew early on in the season, rip these out and plant again. Seed is cheap! They will grow with plenty of time to produce. You can plant several times over the season. It’s Bungowannah (not Bungoanna or Bungowana). 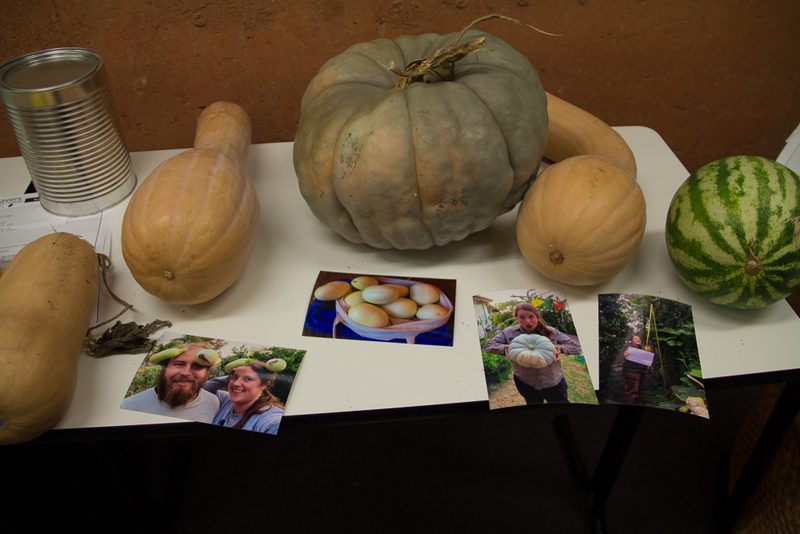 Some people brought along their pumpkins … others had photos of their harvest this year (since eaten!). Group 1: The butternut pumpkins have very smooth, flat seeds and no papery covering. Bungowannah is a locally grown type of crook-neck butternut pumpkin. Reports are that it is “the best” butternut that you can grow with a lot of flesh and skin that isn’t as tough as some pumpkins. It can grow to form quite large fruit. Group 2: The Kent / Jap pumpkins have seeds with lots of little frills on the outside but are the same basic shape as the butternuts. Group 3: The hard-skinned type pumpkins, such as Queensland blue have a thicker coating on the seeds and a papery covering. Spot the difference – can you see the Kent pumpkin seeds’ raggy or frilly edges? The butternut seed has smooth edges. If you want to grow a number of varieties of pumpkin at once, and avoid the risk that they cross-pollinate (which can result in fruit that may or may not be tasty or have the characteristics you wanted), it is advisable to select varieties from different species. For example, plant one butternut type, one Jap type and one Queensland blue type in a garden and the fruit would be true. Planting two butternut types could result in cross fertilisation and so runs the risk of non-true fruit. Harvest pumpkins with at least 10 cm stalk on each. When tendril (next to fruit on stalk) is dry and brown the pumpkin is ready to harvest. Harvest before frosts (not after – old wive’s tale) as frosts can damage fruit and the damaged area will be source of decay. Before harvest try to ripen / dry off whole of pumpkin. Lift pumpkin on straw to keep off ground. Turn pumpkin around whilst still on vine so that paler, less ripe skin is exposed to sun and can harden up. Store in sun to harden (then in cool, dark place). Unripe pumpkins (at end of season) can be picked with about one metre of vine either side of pumpkin and left in sheltered sunny spot (eg verandah) to ripen / harden. The gourds have very different seeds – more rectangular with lots of spikey bits on them. Can carve patterns into growing gourd and lacquer later. Not edible but can be very decorative. Spaghetti squash (Cucurbit pepo) – the flesh can be used as a spaghetti substitute- cook and scrape out with a fork. Or eat with butter, salt and pepper. Closely related to zucchini and other summer squash. Loofahs (or luffa) – allow to dry on vine – flesh will gradually fall off and skeleton will be left. Can be used in bathroom / kitchen as scourers. (Cut up into pieces for kitchen use.) Are very expensive in trendy farmer’s markets. Lots of interesting shapes. One vine will produce more than enough for a year’s supply of loofahs. Cucurbit vines – can be grown on a trellis (just make sure that you support any large fruit with eg netting / nylon stocking). Fruit grown on a trellis may be less curved (gravity at work!) than that grown on the ground. When first growing cucurbits, allow them to form vines, then after the vine is about two metres in length, cut off the main growing shoot to encourage lateral shoots to form. More fruit will form on these lateral shoots. We also collected some pumpkin recipes at this event – we’ll keep you posted when they make it onto this site. 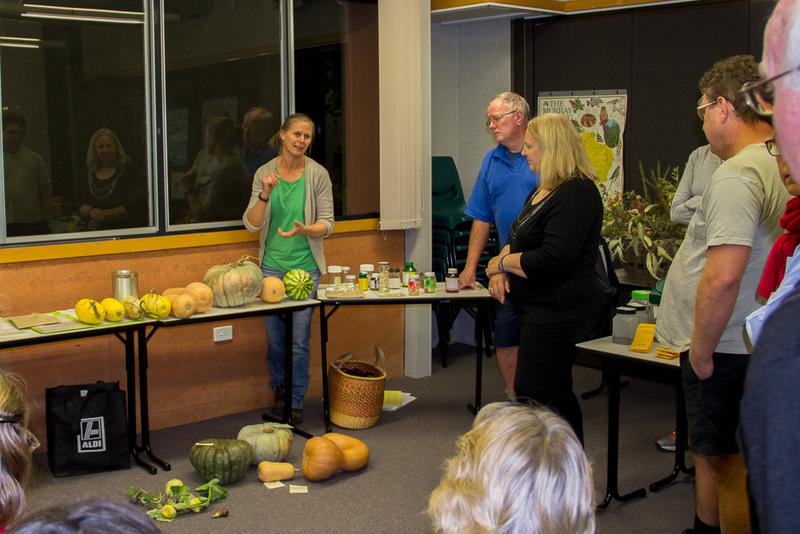 This entry was posted in Event reports, Growing advice, Seed saving and tagged cucurbits, food garden, pumpkins, seeds by Seed Savers Albury-Wodonga. Bookmark the permalink. The Pumpkin marked “Volunteer ?” in the second photo looks a lot like a Jarrahdale Pumpkin. Excellent and helpful information, sorry I missed it.